Save 1000's on CPO quality cars without the stress and dealer games. The variety of cars we carry make us a one stop shop to find the perfect vehicle. Our CPO quality vehicles are low miles, fully serviced and reconditioned. The Sales process is smooth, and stress free , furthermore we fight the bank to secure the lowest rate for our valued customers. We have very unique vehicles that are hard to find in such low miles, color combinations, packages, and fully serviced. Such cars are hard to find and will be sold fast. Our prices are dropped to rock bottom from now till month end. The closer we get to tax season the higher the prices will go so that being said its the perfect time to get a hell of a great deal. Our finance team has over 50 years in experience combined and the work hard to get the lowest rates to meet you budget. Bad credit, no social, please let us help you as we are financing people with 400 fico score. Customers who lost hope being turned dawn every where were able to leave with a dream car. Average credit, working hard to get you the lowest rate for your tier is where the huge savings will be. No one will get you a better rate than us guaranteed. Good and great credit we have all the prime banks to compete for the lowest rate, and our process is super fast and easy in less than 2 hours our cars are sold and delivered. We offer a great extended warranty that is a mirror of factory warranty with 0 deductibles, towing assist, and car rental. 0 dawn 0 payment for 90 days. We beat Kelly blue book instant cash offer for your trade. We help delivering cars within a 100 mile for free. We uber our pre-approved customers for up to a 100 mile. Serving our community with the highest reputation ratings for over 17 years. Mind Blowing Power! Our One Owner, Clean CarFax 2014 Jeep Grand Cherokee SRT8 4X4 shown in Redline 2-Coat Pearl is a very rare machine that is powered by a race-inspired 6.4 Liter HEMI V8. A healthy 465hp is managed by an innovative 8 Speed Automatic transmission, which launches this sure-footed 4X4 with impressive acceleration. With strong Brembo brakes, quad exhaust and superior suspension, the performance of this Jeep is like nothing you've ever experienced. The SRT8 is upscale inside and out. LED running lights, premium leather trimmed heated front seating, and a speaker sound system with three subs and a high voltage amplifier are just a sampling of what you can expect. In addition, find a 6.5 inch touch screen with navigation and Bluetooth to keep you safely connected. Our Jeep Grand Cherokee earns great ratings for advanced safety measures. Ours comes standard with four-wheel anti-lock disc brakes, stability and traction control, front side airbags, side curtain airbags and active front head restraints. 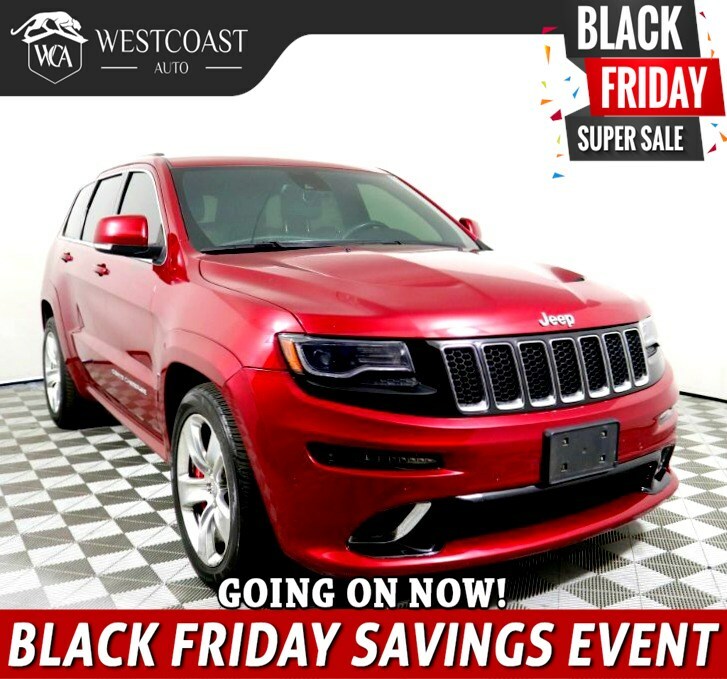 With Jeep leading the way in innovative technologies that are designed to protect you and your family, this Grand Cherokee is a must-have. Print this page and call us Now... We Know You Will Enjoy Your Test Drive Towards Ownership! Great quality, easy financing and affordable prices aren't the only things that make Westcoast Auto Sales the first choice of many discerning auto buyers. Stop in and See California's Dealer of the Year!